This week’s goal was to make enough to cover a quick flight trip to San Jose on Thursday or Friday to play a $1,080 WPT Shooting Star Main Event satellite on Thursday or Friday. 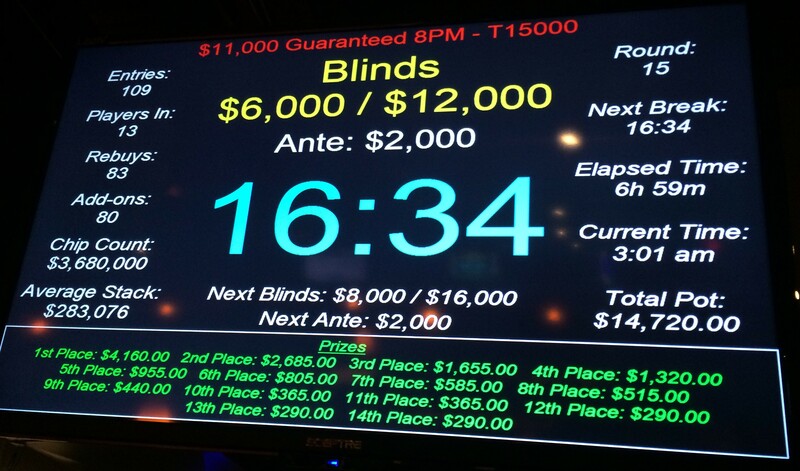 The Main Event is $7.5K, so the satellite pays out better than 1 in 8. A couple weeks earlier, the flight would only have cost about $200—there’s a lot of tech-related traffic between PDX and SJC—and you could have done it for less than $1.3K total if you didn’t mind hanging in the casino all night long (Bay 101 is just a mile or so from the airport). Limit O8 used to be my game. Perhaps Big O has corrupted me. Two sessions. Forty-two minutes. 50 hands. -50 big bets. I was doing pretty well in this event. There were seven $1K prizes in the pool (and over $700 for 8th place), we were down to about 40 players, and I was well over average. I had a fairly aggressive player on my left, who’d called an all-in for 15% of his stack from SB with 9♦3♦, hitting a flush on the river to crack T♦T♠. Just a few hands later, I have 9♦9♠ and raise 3x to 250. Aggressive guy pushes it to 2.1K. I shove 8.3K and he calls with 5K behind. He has a slightly better hand this time: J♥K♠. The flop is 4♦T♦9♣, I’ve managed to make a set! The river is Q♣, giving him the straight. Ninety minutes. 82 hands. 41st of 103 entries. I couldn’t play the big Saturday games at Lincoln City, Encore (a $25K special guarantee), or The Game ($20K guaranteed to first place), so I tried to console myself with the Friday night game at Encore, which had a smaller guarantee because of the next day’s tournament. I was bad. In the second level, a couple of players had limped in and I raised from 200 to 700 with 2♦5♦. 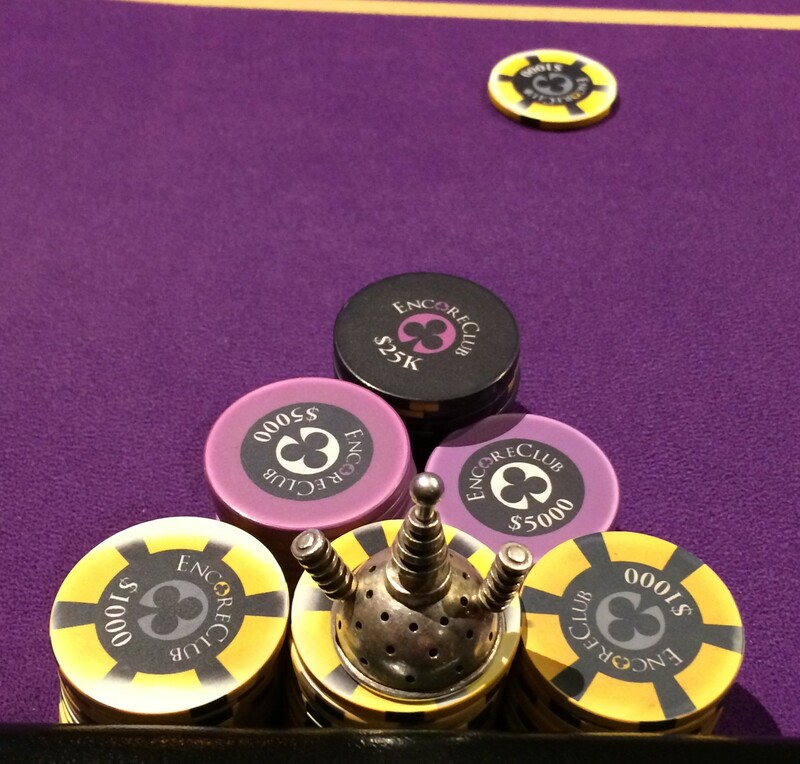 The player on the button raised to 2.1K and one of the limpers called the re-raise. I was closing action, and I made the call. On a Tx6♦4♦ flop, the limp-caller over-shoves for nearly a full starting stack. I go all-in on the call, figuring I can re-buy if needed, then the re-raiser shoves. He has AxAx. The first shover has QxQx. Neither has a diamond. The turn is Q♦, giving the shover a set. The river is A♦ giving the original raiser a set. But my hand wins the day with the flush. By the time we got to 22 players (14 places paid) I had 10% of the chips in play, and picked up more than that as we got closer to the money. It’s a dangerous period in this tournament, though, as even the larger stacks have a limited number of big blinds, and I laid down 9x9x and AxQx when a loss to an all-in would have cost me half to two-thirds of my stack. Instead, the player I laid down the nines to shoved again on the next hand, giving his chips to the player on my left who had—you guessed it—nines. And it was that player who took my dwindling (but still above-average) stack out when I shoved AxQx from the SB over two limps, and he called with KxKx in the BB. That knocked me out in 12th place and pretty much dashed any chance of making the Thursday satellite, since my schedule kept me from playing the big weekend tournaments. Seven hours. 12th of 109 entries. +70% ROI. Stopped in after work for an hour or so. I was lucky I won the holler or I’d just have been farther down. Never really got this going, then I got 8♦8♥ in against A♣A♥ and got chopped down to 5BB around hand 30. Managed to triple up with 4♣Q♠ but only made it another 20 or so hands. Fifty-five minutes. 43 hands. 70th of 90 entries. Stone cold bubbled this tournament. I was cruising along pretty well, hit a slow patch, then picked the wrong time to get J♣Q♣ in against Q♦A♦ and I went into free-fall. Two hours and eight minutes. 147 hands. 25th of 140 entries. Doubled up to 4x the starting stack a little over two hours in, then called a small raise and a starting-stack size all-in (about 6BB at the time) that I lost to a better ace. Shipped T♣9♣ and got called by Q♦Q♥ six hands later and didn’t quite make a straight. 81 places paid. Two hours and twenty-four minutes. 138 hands. 173rd of 655 entries. More than doubled my stack but made a 3BB CO raise with A♥5♥ and got jammed on by BB with 7♠7♣ and 12BB. Should have let it go and sat on a 23BB stack, but started sliding from there. There were 8 $1K prizes up for grabs. Two hours. 121 hands. 36th of 112 entries. The same daily tournament I’ve been writing up in my series A Game That Will Live in Infamy. Bad beat. I had 70BB on the button—nearly 6x the starting stack, well above average—and raised over a CO limp with Q♣T♠. BB and CO call. The flop is K♠J♦9♣, a perfect rainbow wrap around my cards. Both the other players check and I bet 2K. BB has a stack nearly as large as mine, and raises to 6.4K. CO folds, and I shove, BB calls with K♦J♥ and the river is J♣. I’m out on the next hand, shoving J♦K♣ with 13BB and getting knocked out by 7♦9♦ calling off a third of his stack. Two and a half hours. 177 hands. 47th of 138 entries. I was playing this simultaneously with the 6-Max, something I rarely do. I had a decent stack near the end, about 24BB, made a defend with K♣Q♦ against a 16BB stack in middle position and lost to A♠6♣. Four hours and thirty minutes. 194 hands. 31st of 501 entries. +155% ROI. Took a big hit when I got all in with K♠J♠ and two pair, then got four-flushed in diamonds by A♦5♣ on the river. Ninety minutes. 66 hands. 319th of 577 entries. Didn’t even make it close to registration cutoff for this one. Lost a big hand drawing to the nut flush with K♣A♠ on a Q♠8♠3♥4♠ board v a BB call from J♠2♠. Thirty-five minutes. 29 hands. 58th of 75 entries. Quadrupled my stack, then got knocked back a couple hands, then lost a flip for half my stack QxJx v AxKx. Got lucky with A♥4♥ and caught my kicker against A♦J♥, then J♣A♠ lost for me in a race against T♦T♣. Doubled back up again and busted with 9♥9♦ against K♥A♦. The flop was a scary 5♥3♥2♥, I got semi-saved by the 6♣ (since any four except for 4♥ meant the straight was a chop), then the river was K♣ and I went out one short of the bubble. Two hours and forty-five minutes. 184 hands. 26th of 135 entries. I don’t typically play the noon games anywhere because of some family scheduling issues, but Encore announced a $9K special event Thursday that gave me one last shot at making the Friday satellite*, and I decided to make my door fee do double duty. Things went reasonably well, although I got virtually no big pairs during the course of the tournament, I did get combinations of AxKx more times than I can ever recall having before, which came in handy as the structure of the tournament plays out very short. I was one of the two smaller stacks at the table as we approached the money bubble, and a woman at the other end of the table shoved for what looked to be about the same amount of chips as me. I had A♠K♠. 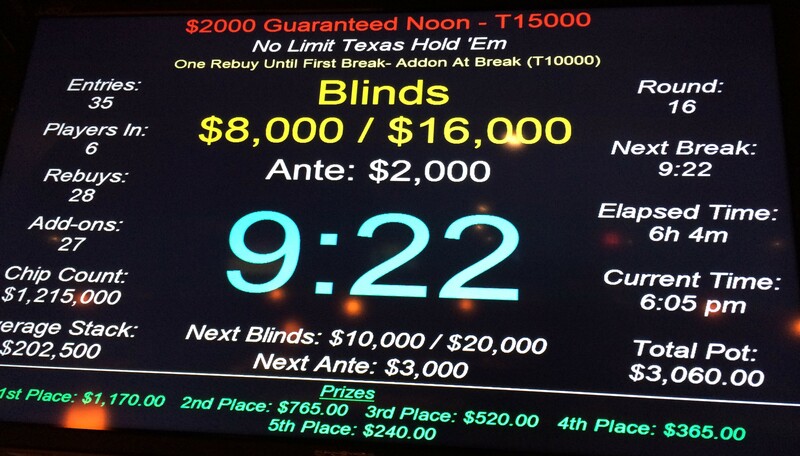 I had 129K—you can see from the tournament screen photo that even an average stack would have only 12BB—and I shoved. The big stack in BB thought about calling, and asked who got paid if both the all-ins got knocked out on the same hand (it would have been the original raiser, because she had me covered by 3K). Then he folded. The original raiser had J♠J♣. A♣ on the flop and K♣ on the turn and everyone thought I’d won the hand for a second before the big stack saw that there were four clubs on the board, and I was out on the bubble. Five hours and forty minutes. 6th of 35 entries. I had an early setback with a sticky player following me down to the river with a flush draw, that cost me 6K for my initial raise, c-bet, and turn bet, but I quickly picked off a bluff from a different player after flopping top two that more than made up for it, and I kept having the best hand for a couple of hours. By the first break, I’d more than doubled the 15K starting stack, knocked out a player just after the break (64K, including the 10K add-on), got more than double the chips I’d lost to the flush guy in a hand (72K), then one of those things happened. There were three limpers in the pot at 500/1K/100, I raised to 5K with A♠J♠ and got two callers, including one of the regular dealers from Final Table and the flush guy. Ace-high rainbow flop. Both players check, I make a pot-sized bet of 15K and the dealer goes all-in for about 36K. Then flush guy shoves for less. There’s 90K in the pot. I have to call just over 21K. If I’d known my odds were in the <1% range, I might not have made the call. The dealer had a set of sixes. Flush guy had limped in with A♥Q♥. There’s one heart on the flop, and two more by the time we hit the river. Flush guy makes—naturally— a flush. 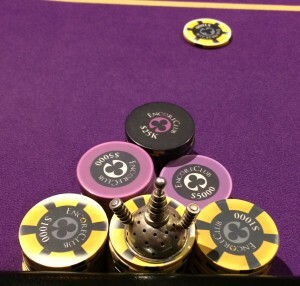 The dealer gets a side pot smaller than her original stack. Next hand I raise to 3K with A♦9♦ and the guy on my left pops it up to 11K. I take it to be protecting a small pair and shove, but no, it’s kings and he calls. No ace, no diamonds, and no trip to San Jose today. The tickets were a lot more expensive by now, anyway. Two hours and thirty minutes. 84th of 139 entries. So that’s the end of that self-challenge. There’s one more WPT main tour event in the West, at Thunder Valley in a couple of weeks, and I’ve got jury duty during the Main. 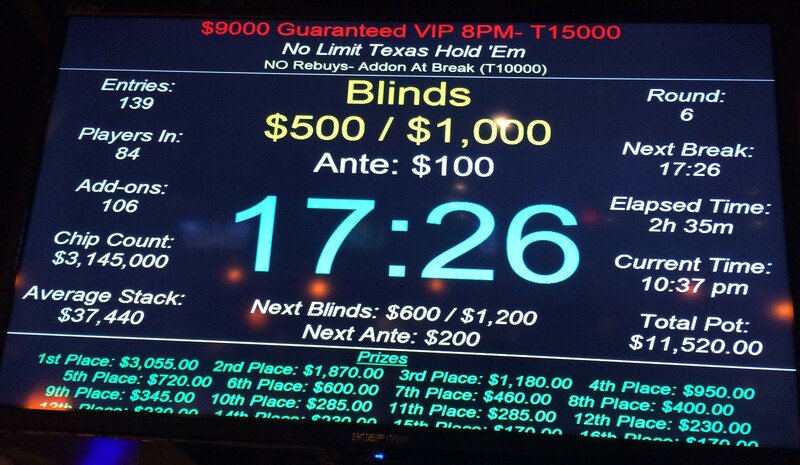 If I do well at Final Table tonight in the $20K (see you all there), I may see if I can postpone that….